The Texas eviction notice forms are used in the event that a tenant has breached a lease, either from non-payment of rent or other breach, and the landlord wants to him or her on notice that he or she will be commencing eviction (also known as forcible entry and detainer) proceedings in the local Texas Justice Court. It is important that the landlord provide proper notice and wait the requisite period of time so that the eviction proceedings will not be dismissed. The tenant has the option to respond to the notice to quit by either complying with the violation or moving out. If the tenant does not do either then the landlord may proceed to court to file a Complaint for Eviction. 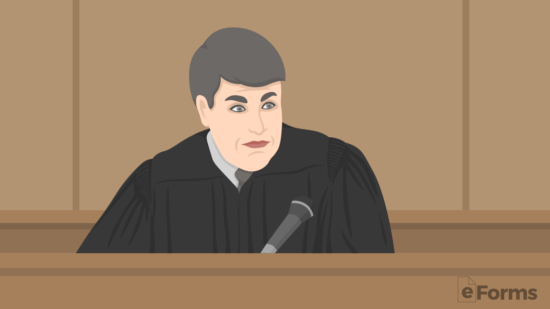 If landlord receives a judgment in his or her favor, then the court will issue a judgment. If tenant still fails to leave, the landlord can ask the court for a Writ of Possession. 3-Day Notice to Quit (Non-Payment of Rent) – This form is to let the tenant know that if he or she does not pay the past due rent, then he or she is subject to eviction. 3-Day Notice to Quit (Non-Compliance) – This form lets the tenant know that he or she has breached the lease and that landlord will seek eviction if the breach has not been rectified within three days. 30-Day Notice to Quit (Month to Month Tenancy) – This form is to let a party to a month-to-month tenancy know that the other party does not intend to renew the tenancy at the end of thirty days. In Texas, rent is due on the date specified in the lease. After receiving a notice of non-payment of rent, tenant has three (3) days to pay what is owed before landlord can seek eviction in court. If the tenant fails to respond either by curing the breach or moving out within the requisite time period, landlord may then proceed to the Texas Justice Court whose jurisdiction covers the town in which the premises is located to file a Complaint for Eviction. In addition to the Complaint, the landlord will have to file a Case Information Sheet and a Military Service Affidavit. These will have to be notarized before filing. There will also be a filing fee, the amount of which depends on where you file. After the filing of the Complaint the tenant will have the option to reply to the court through the Original Answer. 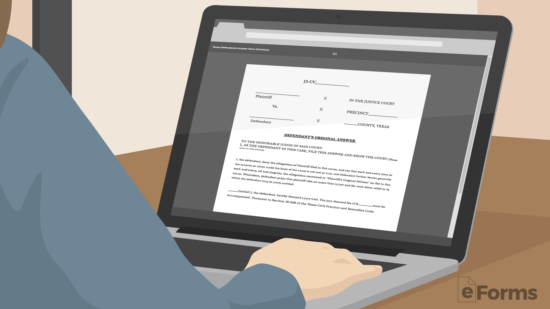 This form will display the tenant’s side of the story and afterwards the court will give a hearing date. The court will then serve both parties of the date and time of the hearing. If the landlord prevails in court, the tenant has five (5) days to appeal. If the tenant does not appeal and remains on the premises, landlord can file a request a Writ of Possession from the Court which, if granted, authorizes the sheriff to remove the tenant. The Texas Notice To Quit form, available for download by clicking one of the buttons by the image (on this page), will need information from the Rental Agreement or Lease it concerns. Locate the original, or a reliably legible copy, of the Lease and keep it accessible when filling out the Notice form. Each person who is to be issued a Warning or Notice must have his or her Name listed on the line below the form’s title. If the Name appears on the Lease, make sure to transcribe it successfully on this line. This Notice will verify the Location of the concerned Property by listing the Street Address along with some basic geographical information. The first piece of information that must be supplied is the City where the Property is located. The next blank space will require the County to be entered. The third blank space calls for the Zip Code. The next space in this statement, following the term “…number and street…” will need the Building Number and the Street of the Leased Property entered. The last blank space of this first statement provides a space for any applicable Apartment Number or Unit Number to be reported. The second statement, introduced by the term “In accordance with your lease…,” will need three pieces of information. The Day, Month, and Year the Rental Agreement was Signed and made valid. You may enter these components of the Signature Date in their respective areas. You must designate what type of Notice you are sending in the area below the words “Check Appropriate Box.” Here, there will be four statements available for review. You must choose the one that states the terms you wish delivered to the Recipient of this document. You may select any of the following Terms to issue the intended Recipient by marking your desired statement’s corresponding check box. 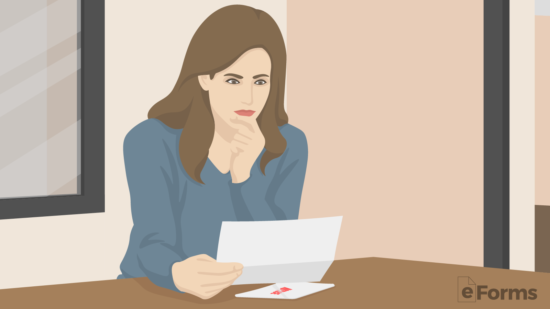 Statement 1 – “Nonpayment.” This Notice will demand the Recipient to submit an Overdue Rent Payment within Three Days of receiving this paperwork or to move out of the Leased Property so the Landlord may retake Possession. If choosing this selection, be prepared to report the Name of an Authorized Agent, the Total Past Due Rent Amount, the Minimum that must be Paid, and the Rental Period that must be paid for in the appropriate areas. Statement 2 – “Noncompliance.” This Notice will demand the Recipient to cease and correct one or more violations to the Rental Agreement or surrender possession of the Rented Property to the Landlord in Three Days. The blank line in this statement must have a description of how the Rental Agreement was violated by the Recipient. Statement 3 – “Month To Month Tenancy” from the Landlord. In order for a Landlord to inform a Tenant(s) that he or she will terminate the Monthly Lease Agreement these two parties share Thirty Days after the Tenant(s) receives this paperwork. The Date entered across the three spaces in this statement will be the Date the Lease will be considered Terminated. Any Date may be the Termination Date but it must be at least Thirty Days after the Tenant Receipt of this document. Statement 4 – Month To Month Tenancy” from the Tenant. If this document is being generated by a Tenant and issued to his or her Landlord for the Purpose of ending the Monthly Lease in place, then mark the fourth check box. Make sure to list the final Date of this Lease in the spaces available. A Landlord issuing this document should make sure that he or she is conveying the demand for the Tenant to Comply with the Terms and Expectations stated in this form. There will be a paragraph just after the Notification Statement area that will plainly state this expectation of Recipient Compliance. The Landlord/Agent must certify this statement’s validity by Signing his or her Name on the Signature Line provided. The Delivery of this document should be verified with a statement by the Agent serving the Recipient(s). The last section of this document, “Certificate of Delivery,” will have two areas. The statement making up the first area will need two pieces of information which may only be supplied upon Delivery. If you are the Deliverer, use the spaces in the statement beginning with “I certify…” to report the Date of Delivery and the Name of the person the Deliverer relinquished the document to (Recipient). The second area will be three check boxes, each with a Delivery Statement (of which one must be marked). The check box marked will declare how this document was Delivered. If it was hand delivered to the Intended Recipient, the first check box will apply. If this Notice had to be left with an adult who is reliable (i.e. family) and will be counted on to deliver it to the intended Recipient, the second check box will apply. If this Delivery was made by First Class Mail (USPS), the third check box will apply. The Signature line after these statement will demand the Signature of the Delivery Agent when Delivery may be considered completed.